i recently went with a few of my best friends on the planet to see a concert. we watched passion pit perform at terminal 5 in new york city. we went into the show with complete disregard for the opinions that other concert attendees may have had about us. we had the time of our lives. our entire group was sporting glow-in-the-dark florescent colored glowsticks -- around our necks, our wrists and forearms, our belt loops, and sticking out of our hair. we wondered beforehand if we might be the only ones glowing that night. we were; and we loved it. we bounced and danced and sang our hearts out. we were 100% in the moment and loving the experience for exactly what it was, while we were in it. so thinking about our night struck a chord with me. who the heck cares what anyone else thinks about you? who cares about that opinion someone has created in their mind about you? opinions always change anyway, because as people we always grow and learn. if you follow your priorities, your goals, your heart -- YOUR opinion of yourself is the only one that really matters. make a commitment to yourself not to do things or make decisions based on account of how it may affect another's opinion of you. instead, do the things that YOU feel are in line with who you are, what you want to accomplish, and the person you want to someday become. my friend steph is an exceptionally good example of this: wearing black socks with sneakers, taking sewing classes, going to movies alone, writing and performing poetry, singing in the shower. she is her own person; comfortable in her own skin. 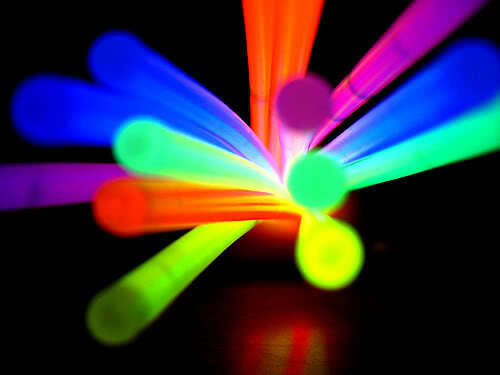 go wear a metaphorical glowstick today.